Last week a long life ceremony for Shamar Rinpoche was held at the Kagyu Monlam, led by His Holiness Karmapa. Please click here to view a video from the ceremony. 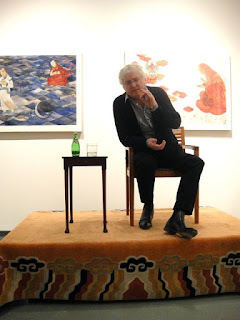 On the evening of Thursday, December 15 Lama Jampa gave a public talk, entitled Buddhism for Modern Times, at Tibet House in Manhattan, New York. This was a significant event, marking Lama Jampa's first public teaching on the East Coast in the US. The talk was well attended and there was a lively question and answer session afterwards. Lama Jampa will remain in New York with family for several days before returning to England for the New Year. His next teaching event will be in Bristol on January 14 where he will teach Sakya Pandita's Letter to the Noble Minded and bestow the Initiation of White Saraswati. Click here for details. His Holiness Karmapa's official website has been updated with a number of news items covering His Holiness's recent visit to Sanchi in Madhya Pradesh, India and the start of the Kagyu Monlam in Bodhgaya, India. On the weekend of 3 to 4 December, Lama Jampa Thaye taught the final part of Clearing the Darkness of Unawareness in Manchester. In the afternoon on the Sunday, Lama Jampa bestowed the Initiation of Green Tara from the lineage of Chokgyur Dechen Lingpa, which Lama Jampa received from Kalu Rinpoche. The puja associated with the particular initiation of Green Tara is practised in many dharma centres, including Tegchen Legshey Ling in Nepal where it is practised daily every morning. This puja is also performed monthly on the eighth day of the lunar calendar at Kagyu Ling in Manchester. Lama Jampa gave this initiation to enable students to attend a three day Green Tara retreat to be held at Kagyu Ling after Christmas. Next year the second cycle of Shedra teachings in Manchester will commence with ‘The Friendly Letter’ by Nagarjuna and its accompanying commentary ’The Telescope of Wisdom’ by Karma Thinley Rinpoche. His Holiness Sakya Trizin has just concluded a tour of North-Eastern India. His Holiness spent several days at the Sakya monastery in Kalimpong where he bestowed the initiations of Mahavairocana and Vajrapani. Following this His Holiness visited Sikkim for almost one month. He visited the Sakya monastery in Gangtok, Sikkim where He gave the initiation of Vajrayogini. He also visited and gave teachings at a number of Kagyu monasteries in Sikkim. His Holiness spent the last part of the tour in Darjeeling, returning to the phodrang on 16 November. His Holiness travelled to Delhi on 26 November where He will attend a conference. Following this He will travel to Lumbini in Nepal for the Sakya Monlam which is scheduled to start at the beginning of December. On the weekend of 5 to 6 November Karma Thinley Rinpoche stopped over in London on his annual journey from Nepal to Canada having spent several months this year in Nepal and also visiting Tibet with his attendant, Kunga, during this time. Rinpoche was hosted in London by Lama Jampa Thaye and Dechen Dolma. On the Saturday, Lama Jampa asked Rinpoche to bless members of the sangha who happened to be visiting London at that time. Rinpoche kindly agreed to Lama Jampa's request and also bestowed the reading transmission (lung) for his commentary on Nagarjuna's Friendly Letter. Before Rinpoche began the reading transmission, Lama Jampa offered Rinpoche a Mandal Tensum for Rinpoche's long life. 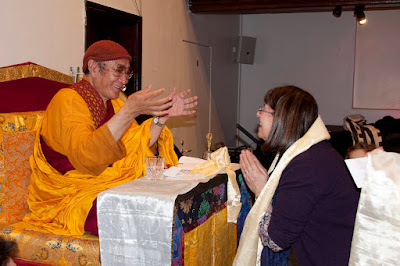 Rinpoche will now spend the winter in Canada before returning to Nepal in the spring. Lama Jampa Thaye's latest article for the Tricycle magazine blog is now available. Please click here to view the article, titled "The Vidyadhara Vow: Reading the Small Print of the Vajrayana". Lama Jampa Thaye visited Los Angeles to bestow a number of dharma teachings from 22 to 30 October. On 22 to 23 October, Lama Jampa bestowed teachings on the Madhyamaka View and the initiation of Manjushri at Sakya Samten Ling in Santa Monica. 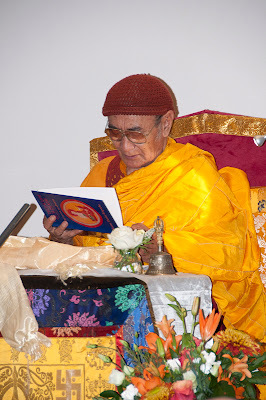 On Wednesday, 26 October Lama Jampa's teaching programme continued with 'The Letter from the Heart' by Patrul Rinpoche at Kagyu Do-Nga Choling. The event was very well attended by people from several dharma groups in West LA, who listened attentively and asked many questions arising from key points in the text. 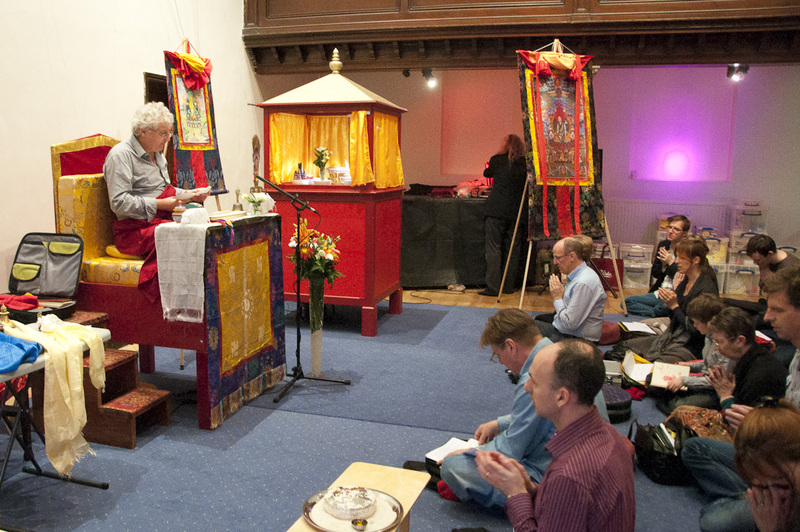 Lama Jampa returned to London, England on Monday, 31 October and will bestow the Zhenpa Zhidral and the initiation of Orange Manjushri in London on 5 November. Lama Jampa Thaye and Dechen Dolma visited Sakya Dechen Ling in Stuttgart, Germany for the weekend of 1 to 2 October. 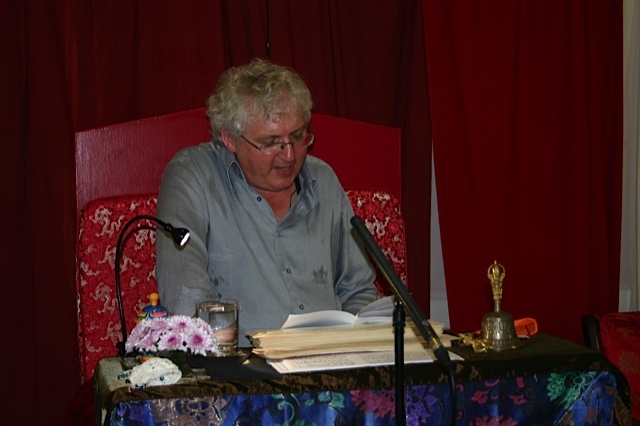 On the Saturday Lama Jampa taught the first half of "The 50 Verses on the Spiritual Master" by the Indian master Bhavideva. In relation to this text Lama Jampa noted: "To practice the Buddhist path we need the guidance of a wise and compassionate master. The 50 Verses is one of the most important Vajrayana texts that explore this topic. In a clear and powerful manner it defines the characteristics of such masters, the nature of their teaching and the correct way of relying upon them. It is indispensable for those who want to practice the Vajrayana." 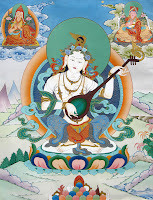 On the Sunday Lama Jampa gave "The Initiation of White Saraswati" (Bodong Lineage). 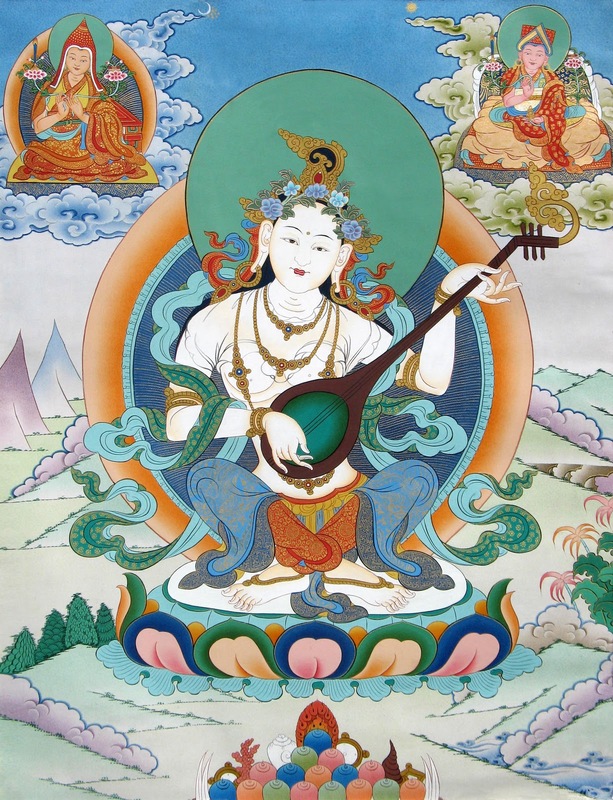 In the Vajrayana Saraswati is regarded as both the embodiment of transcendental wisdom and the goddess of poetry. Thus many practitioners have utilised her meditation to acquire understanding of reality and for her artistic blessings. In February 2012 Lama Jampa will teach the second half of "The 50 Verses" at Sakya Dechen Ling, Stuttgart. His Holiness Karmapa is currently residing in Delhi, India. His teaching program for October has been confirmed. His Holiness will be teaching The 37 Practices at KIBI in Delhi over the course of October. His Holiness's website has recently been updated with a number of interesting articles. Please click here to view the website. Lama Jampa Thaye recently spoke to His Holiness Sakya Trizin who is currently residing in India. The annual Vajrakilaya ritual at Sakya Centre, which took place during the month of September, was a great success. The last day of the puja saw 6000 people attend. H.E. Asanga Rinpoche, one of the dungseys from the Phuntsok phodrang, led a portion of the ritual for the first time. His Holiness recently travelled to Dharamsala, India for a conference with many senior Lamas, including the Dalai Lama. His Holiness is now back in Rajpur where He will remain for a few days before setting off on 2 October for a six week tour of Kalimpong, Sikkim and Darjeeling. In other news, His Eminence Ratna Vajra Rinpoche is currently in Dzongsar monastery in India, where he is teaching the commentary on the Dorje Gur, one of the two explanatory tantras of Hevajra. On Thursday 22 September Lama Jampa Thaye travelled to Sakya Namgyal Ling, Exeter where he gave a concise overview of the Buddhist path to members of the local sangha. The following day Lama Jampa gave interviews in Exeter before travelling to Bristol in the early evening. 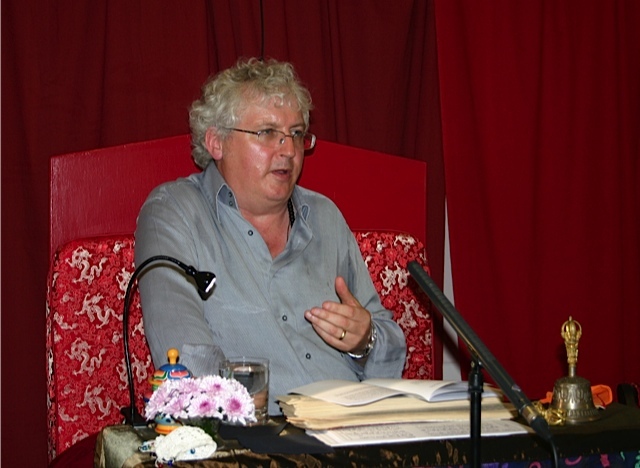 On the morning of Saturday 24 September Lama Jampa taught the first part of the ‘Letter to the Noble Minded’. This brief text by Sakya Pandita clarifies the commitments involved in practising each of the three vehicles of Buddhism. It was written by Sakya Pandita in order to counter erroneous understandings of dharma practice that were extant at the time in Tibet. The teaching remains highly relevant today. In the afternoon Lama Jampa bestowed the initiation of Simhamukha – one of the prized ‘Thirteen Golden Dharmas of Sakya’. Lama Jampa recounted how he had received these precious teachings from His Holiness Sakya Trizin 25 years earlier. He also mentioned that these were called ‘golden’ as their value was such that it was traditional for one to offer gold in order to receive them. Lama Jampa Thaye’s next teaching will be in Stuttgart when he will bestow ‘The Fifty Verses on the Guru’ by Bhavideva, followed by the Initiation of White Sarasvati from the Bodong Lineage. Please click here for further information. After a break of four years, Karma Thinley Rinpoche once again traveled back to his homeland of Nangchen, located in Kham, now part of Qinghai Province in China. This year it was possible for Rinpoche to be able to fly from the city of Zining to within three hours by road from Nangchen, which made the journey much more comfortable; when Rinpoche first returned to Nangchen in the 1980s, the same journey from Zining could take up to five days, depending on road conditions. Rinpoche's family members and old friends were very happy to be able to receive him again, and for two months Rinpoche based himself at his temple, called Tegchen Chokor Ling, located in Nangchen Town. Last year the area close to Nangchen was struck by a terrible earthquake, devastating the regional capitol city of Jyekundo, which is now in the process of being rebuilt; and this year there was another smaller earthquake in Nangchen itself which caused structural damage to many buildings but fortunately no loss of life - because most of the people in the remote nomadic areas had already moved out of their houses and into tents for the summer. There was no damage to Tegchen Chokor Ling, and Rinpoche initiated a repair program to maintain the condition of the buildings. Rinpoche made two major excursions into the surrounding nomadic areas, one was to a beautiful valley called Sanjong, where many of Rinpoches relatives still live. Sanjong is also the location of Jamyang Lobchung School, which was instigated under Rinpoche's direction in 1998 for the benefit of local children. The school now has more than 100 children and has a reputation as one of the best schools in the whole district. All the children live in the school because their homes are sometimes nearby, and sometimes, in the summer, much further away in the grassland pasture valleys high in the mountains.The whole school welcomed Rinpoche, and Rinpoche proceeded to bless the school buildings, teachers, kitchen staff and pupils. The children are aged from 7 to 12, and they put on an extensive show of traditional dance and singing for Rinpoche. Rinpoche was able to stay three days in Sanjong, living in a tent amongst the summer flowers, and enjoying the delicious thick yoghurt presented by the local people. The second excursion was up over a long winding pass to the high grasslands called Drongsho, to visit the site of his family's former palace, which is also Rinpoche's birthplace. Rinpoche knows the name and story behind every single mountain and valley there, and was able to visit both the monasteries of Lhachung and Lhachen, which were previously owned and administered by his family. Rinpoche's consolation for having to leave Nangchen as the summer came to an end was that he was going to be once again returning to the holy land of Nepal, birthplace of the Buddha, and location of his nunnery, Tegchen Legshey Ling, where he is currently residing. On Saturday, 10 September Lama Jampa Thaye visited Kagyu Dechen Dzong in Harrogate. In the morning Lama Jampa taught Geshe Chekawa’s famed commentary on Geshe Langri Thangpa’s Eight Verses of Mind Training. In the afternoon Lama Jampa bestowed the Initiation of Amitayus (Nirmanakaya form) from the Taklung Kagyu tradition. 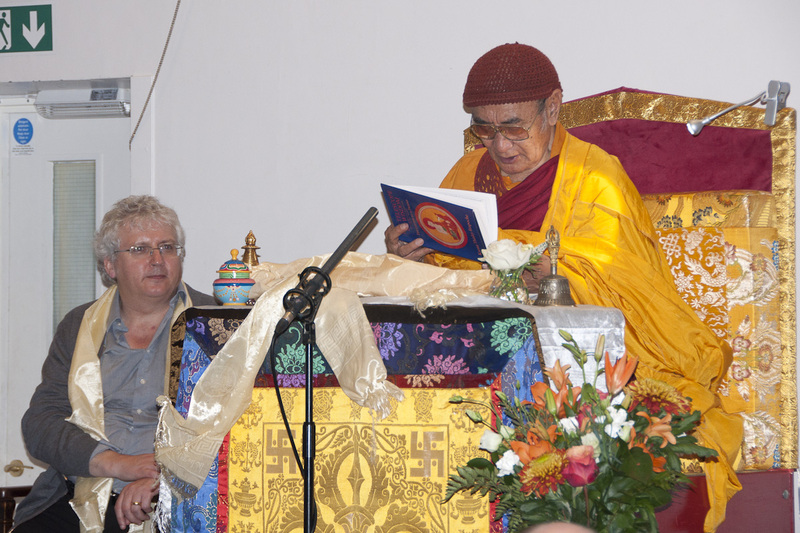 Lama Jampa mentioned that he had received the Mind Training teachings from Karma Thinley Rinpoche in 1979. 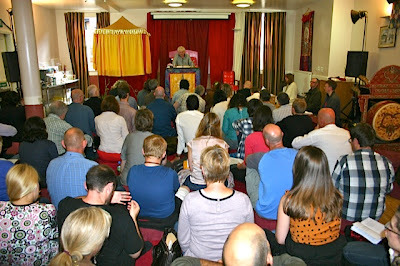 He also noted that Rinpoche considered these teachings to be extremely precious and exactly what is needed in the West. 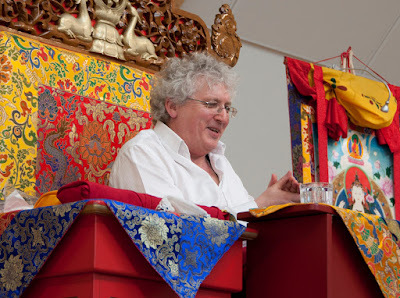 Lama Jampa’s next teaching in the UK will be in Bristol on 24 September where he will teach Sakya Pandita’s Letter to the Noble Minded and bestow the Initiation of Simhamukha. Please click here for further information. 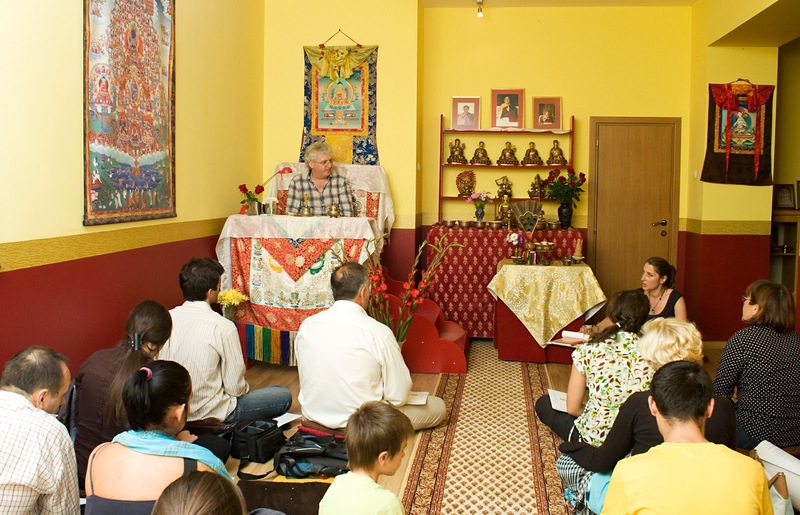 Lama Jampa Thaye recently spent two weeks in Bulgaria. The majority of the visit was spent in Sofia where Lama Jampa was hosted by the sangha of Sakya Choling. During this time, he taught on two separate occasions. 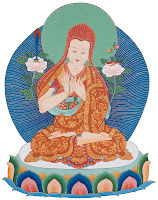 On the weekend of 20 to 21 August, he taught from Rain of Clarity, his authoritative text on the teachings of the Sakya tradition, and also bestowed the initiation of Green Tara from the lineage of Shakya Shri Bhadra. On the weekend of 3 to 4 September, he continued teaching from Rain of Clarity and in addition bestowed the initiation of White Tara from the lineage of Shakya Shri Bhadra. Lama Jampa's next international visit will be to Los Angeles in October where he will bestow teachings at a number of local dharma centres. Please click here for further information.